University of the West of Scotland’s new £70 million Ayr Campus has entered the final phase of development, with a topping out ceremony taking place at the new campus site on 4 June 2010. 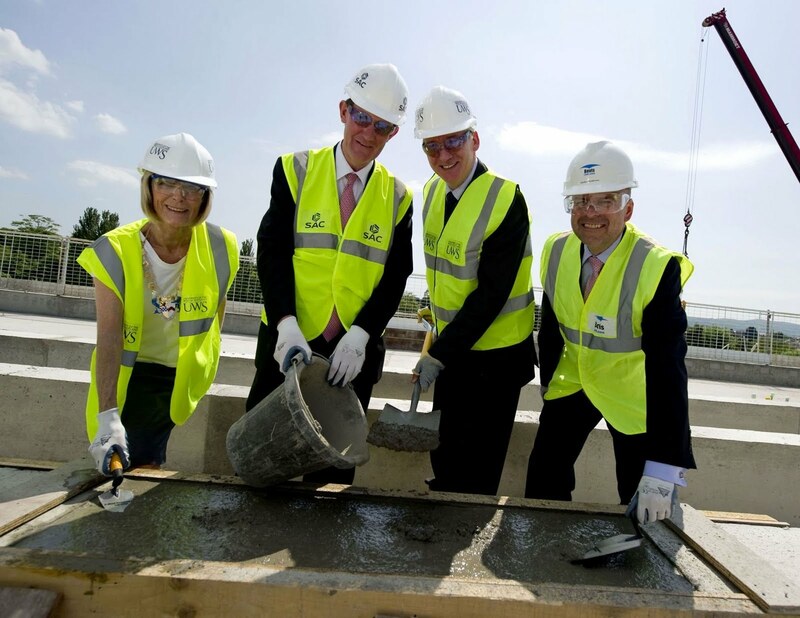 The ceremony marked the structural completion of the new 18,000m2 campus by project contractor Bovis Lend Lease UK. The campus is being developed by University of the West of Scotland (UWS) in partnership with Scottish Agricultural College (SAC) and is situated on the Craigie Estate, next to the River Ayr. Planned and designed by leading Scottish-based architects RMJM, and part-funded by the Scottish Funding Council (SFC), the development will see SAC joining UWS on the site. Shared facilities will include teaching and learning spaces, gym, refectory, library and computing labs. The new Campus is part of the University’s £250million development programme and replaces its existing campus on the edge of the estate. It will create an innovative learning environment for over 4000 students. Developed in consultation with the Natural Garden Society, Historic Scotland, Scottish Natural Heritage and the Scottish Wildlife Trust, the new Campus will provide Ayrshire with one of the UK’s most modern, environmentally friendly and sustainable Higher Education learning environments. The new building is designed to the highest environmental rating – BREEAM Excellent (Building Research Establishment Environmental Assessment Method) – adopting sustainable strategies within the design and operation of the new building. Professor Seamus McDaid, Principal and Vice Chancellor of University of the West of Scotland, said: “We are delighted that our new Ayr campus, which will result in massive benefits not just for the University but the west of Scotland, is in the final phase of development. There are currently 719 Ayrshire business stories permanently archived on this site. To locate those of most interest to you, please use the site search facility in the top left hand corner of this page. Type your search term in the white box, then click the magnifying glass symbol.